This month, the theme is DIY’s and today, we’re are all sharing our five favorite DIY projects on our blogs. I’m adding a little twist and sharing my favorite “types” of DIY projects along with my favorite projects. So let’s jump in to my five favorite DIY projects. At the top of my list of favorite types of DIY’s are any projects that involve paint. For me, paint is the ultimate instant DIY gratification because I LOVE to transform an old piece of furniture (or a room) with paint in a fabulous color. It never gets old for me because paint always makes such a dramatic and big impact. It’s also the easiest way to get started DIY’ing if you’re new to doing home projects yourself. One of my favorite paint projects was revamping our old beat up tired kitchen table into my office/family/craft room table with paint. Breathing new life into a piece that we weren’t using anymore into something that we now use daily is my favorite type of paint project. 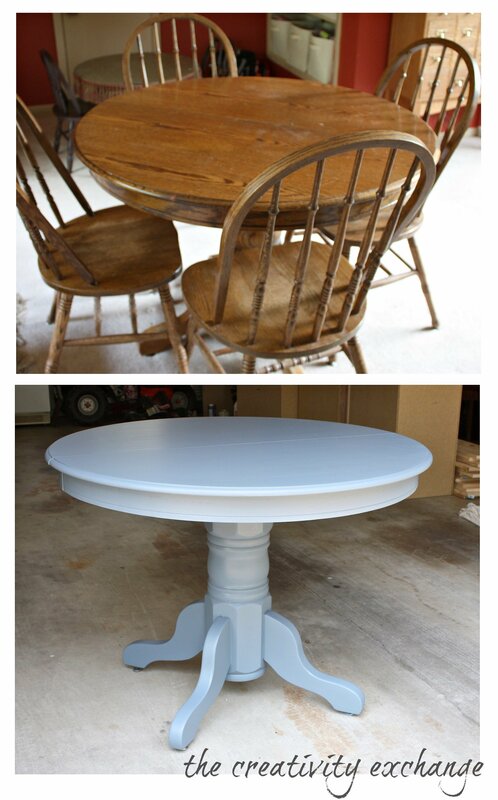 By the way, for this table paint project above, I used oil-based paint because it’s a high traffic furniture piece. If you’re interested in how I did this project, you can find the paint tutorial here. Another type of DIY that I love to do throughout my home is any type of DIY project that involves increasing storage and function in a space. We don’t have a lot of storage in our home and many of my blog projects over the years usually involve us trying to get creative and DIY more storage space. One of my favorite storage projects was our garage pegboard storage wall. I loved this project SO MUCH because we had zero storage in the garage. Our garage is extremely narrow and we came up with a very inexpensive DIY solution that was pretty much life changing for us! Finally creating a home for all my tools, paint and DIY supplies has helped us so much! I still look at the wall everyday and get so much satisfaction that we came up with a solution to a problem that I never dreamed we could solve. We also did something very similar to the framing of the pegboard wall in the garage and created a narrow mudroom in our home by the back door. 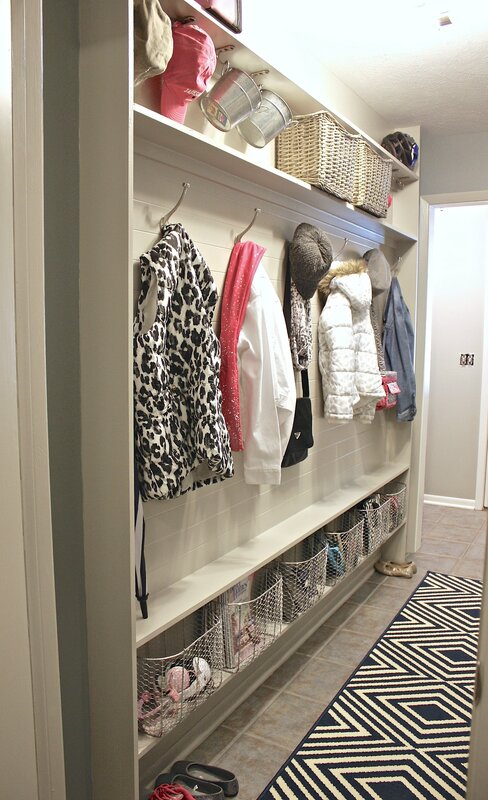 We only used 5.5″ of depth to DIY this much needed mudroom wall storage. Coming up with easy DIY solutions to solve storage problems around our home REALLY makes me giddy and has been one of my favorite types of DIY projects. Because we have very little storage in our home, I do a lot of traditional organizing projects to really maximize the space that we do have. Whether cabinets, closets or drawers, I have slowly been working my way through our home over the years, coming up with DIY solutions to help us better stay organized and utilize space. 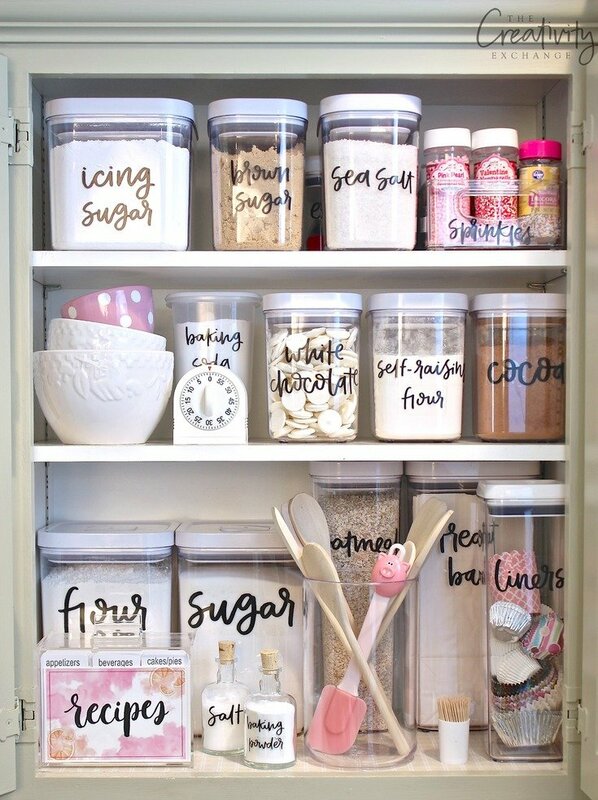 One of my favorite DIY organizational projects is a recent project that I did with hand lettered free printable labels that Jo from Zeur Designs and I collaborated on and created together. I used them to organize my baking cabinet and pantry in my kitchen. 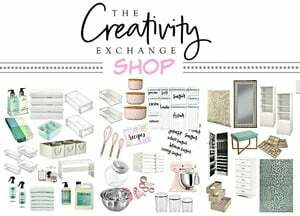 If you want to check out more of my organizational DIY’s, you can find them here. Another favorite type of DIY that I do a lot of around our home are all of the fun outdoor DIY projects. 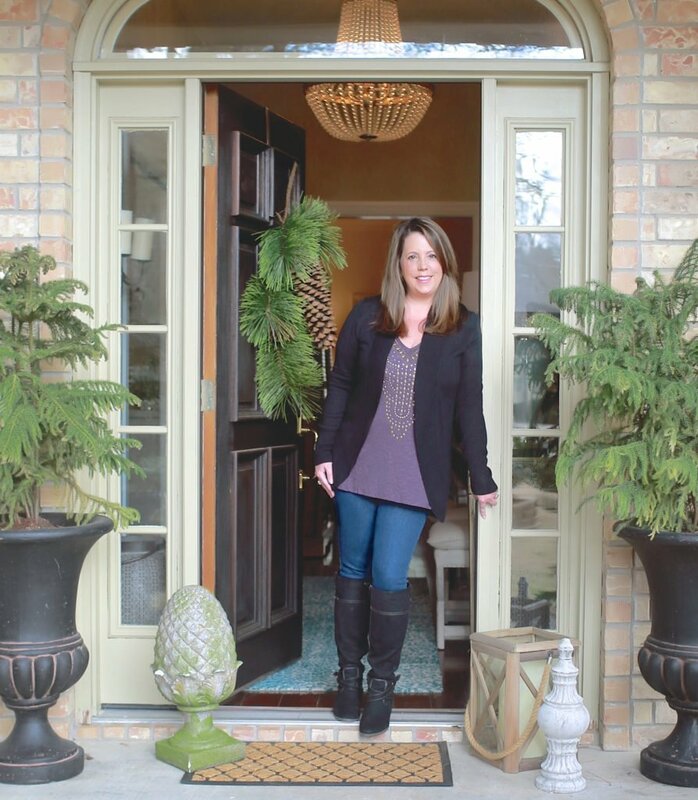 I love any kind of DIY outdoor project like refreshing outdoor furniture and accessories with a fresh coat of paint, creating pretty garden container pots and landscaping. I recently refreshed our back patio area for the summer with several little DIY projects. I really love a whole room project that incorporates all of those different types of DIY projects that I mentioned above and love! It’s so fun to be able to pull a whole room re-design together using creative DIY solutions, paint and breathing new life into an old piece of furniture or accessories. My favorite whole room DIY project has been my daughter’s bedroom revamp project. My (then) 10 year old daughter and I teamed up and pretty much DIY’d and revamped everything in her room. We repainted all my daughter’s furniture with fun patterns and we also created this fun gallery wall art project that we made using calendar art. I hope there is a project here today or an idea that inspires you to do a DIY project yourself. It’s really the best feeling to be able to refresh, revamp and create yourself! Thanks for stopping by today and be sure and check out out the other bloggers in today’s series and their favorite DIY projects! All of these ladies are so creative and inspiring and I can’t wait to see what they share! Here are the links; Kris from Driven by Decor, Jennifer of Dimples and Tangles, Lisa from Shine Your Light and Pam from Simple Details. Oh my goodness! 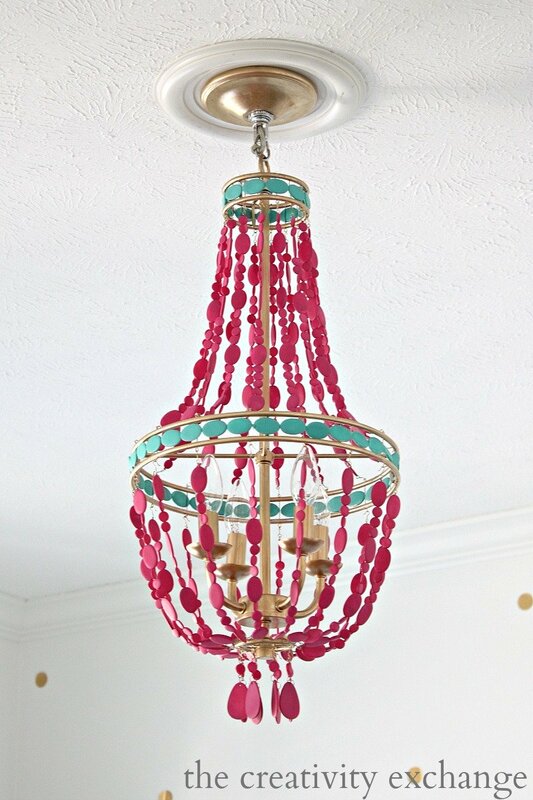 Your diy’s are jaw-dropping! Excellent job! Candy it’s so fun to have you join us today!!!!!!!!!! You are the queen of DIY, your daughter’s room and your amazing craft room are two of my very favorite spaces of yours! Beautiful and so creative! We knew exactly who to call for this month’s guest, you rock DIYs like no one!! Thanks so much for sharing your talent with everyone, Cyndy! 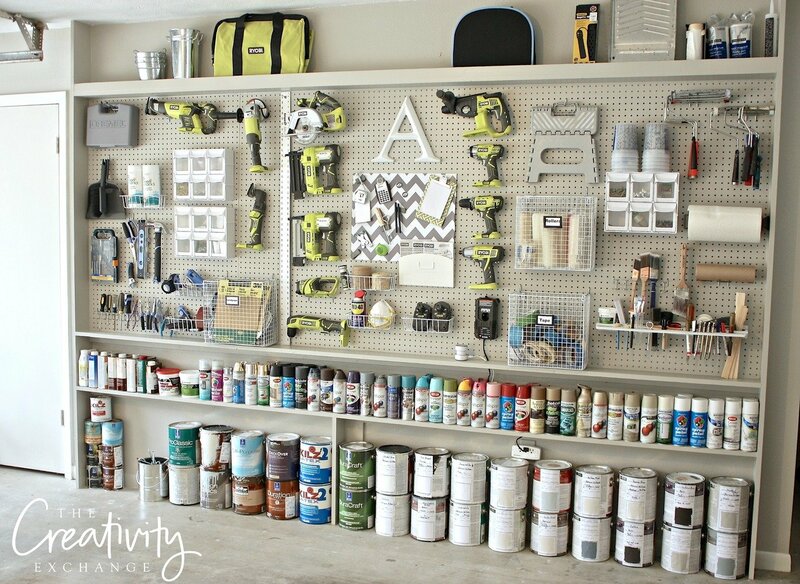 I’ve always been smitten with your beautifully organized garage!!! Enjoy your summer on that pretty patio, sweet friend! Love these projects. You are the craftiest! Thanks for sharing. I got some good ideas from this post. You have mad DIY skills! So much eye candy…I have to go back and read more. I’m sure your daughter will be as talented as you are! 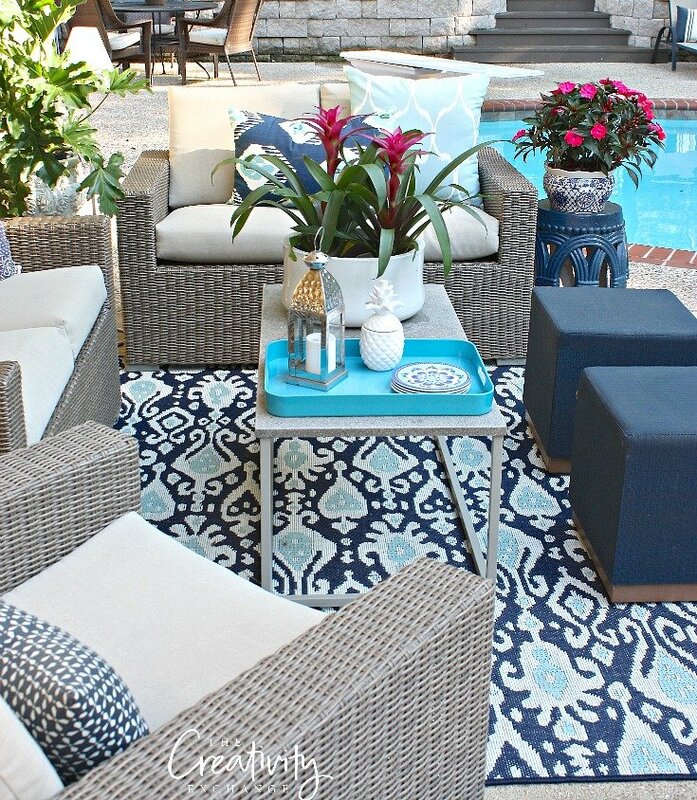 Love the patio decor…looks like a wonderful place to relax. You are the perfect guest host for this topic my friend! 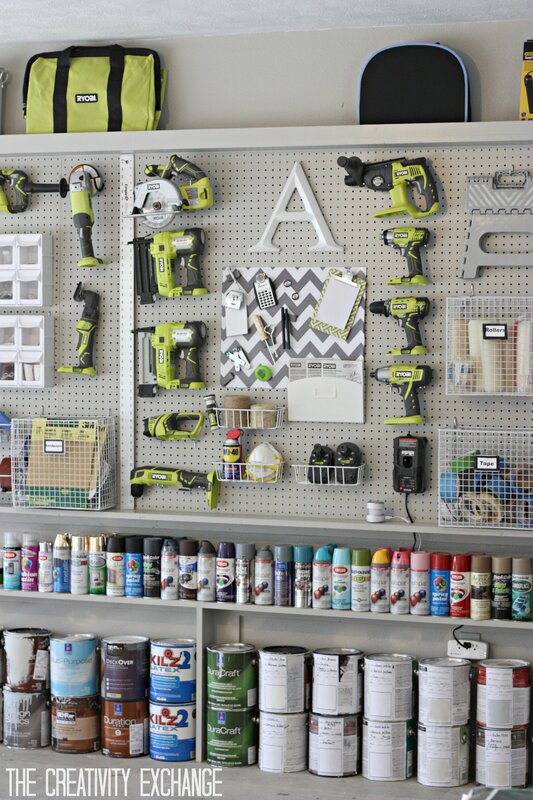 And I love that you included a few DIYs that I hadn’t seen before – I’m dying over your garage organization!!! I love your daughter’s room so much! And I’m SO envious of that beautiful garage wall- we desperately need a pegboard and some organization there! Thanks so much for joining us today, your projects are fantastic! I love your painted table in the craft room. Did you make or buy the framed pictures under the sconces? 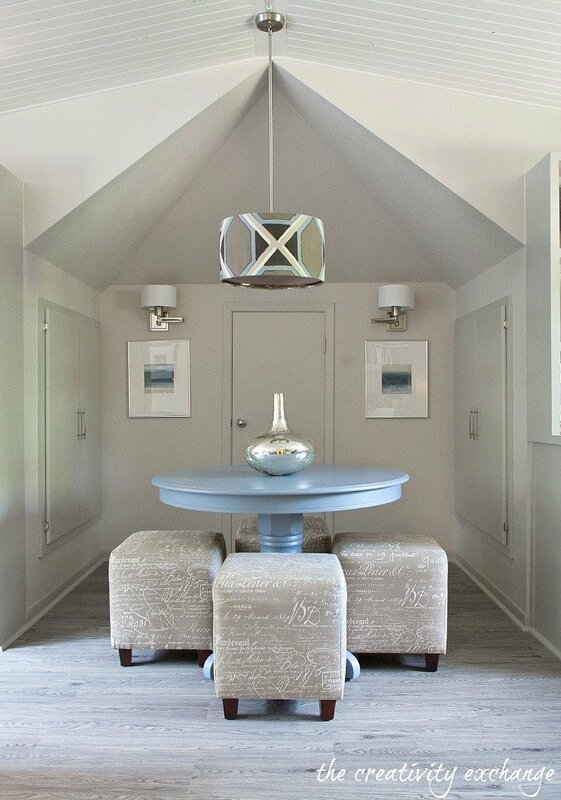 I have been searching for something similar as I the same color table. 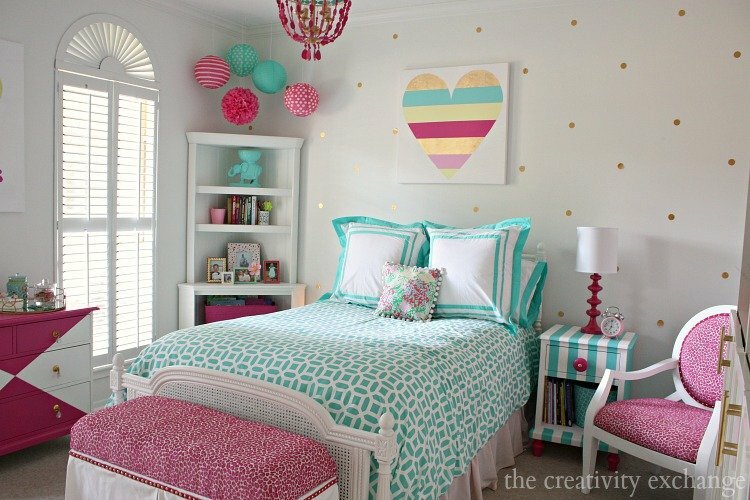 Love your daughter’s room! Where did you find the heart picture above her bed? 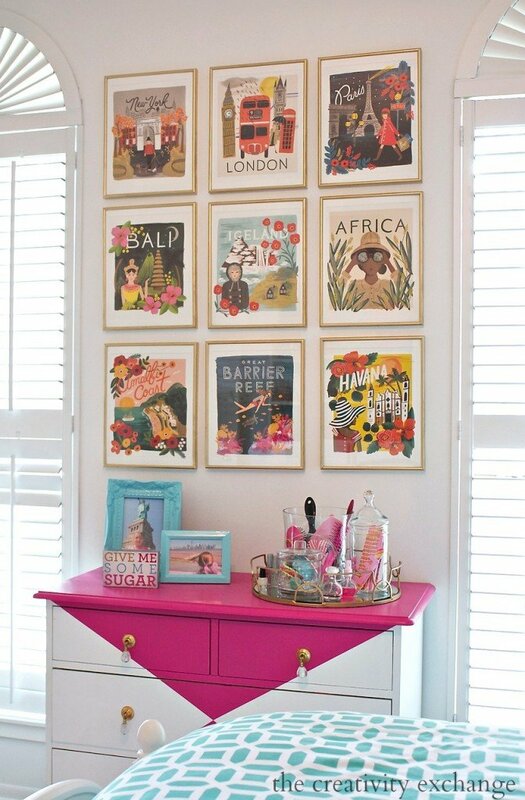 It would look perfect in my daughter’s room! Hi, love your blog! Can you tell me where you bought the vintage city prints? Your house is beautiful!